Located on W Colfax Ave between Holland St and Garrison St, Extra Space Storage serves Lakewood residents near Eiber, Heverley Heights, Cedar Crest, Holbook Park, Morse Park, Applewood, and more. Locals will recognize our facility near Chase Bank and Prestige Imports. Are you a college student in the Denver metro looking for self storage for the summer or while you're studying abroad? Extra Space Storage is about 2 miles from the CCU campus, so we're a great option! 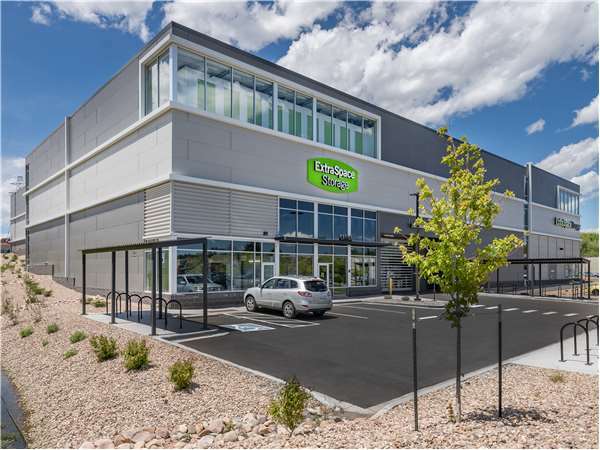 With a large selection of storage units, climate-controlled storage, and exceptional security, Extra Space Storage on W Colfax Ave is the storage partner for you in Lakewood! No matter what you plan to store, our Lakewood storage facility has the space to accommodate your needs! We offer unit sizes as small as 5x5 and as large as 10x40. With 24-hour video surveillance and electronic gate access, you can rest assured your valuable belongings are well-protected at Extra Space Storage. When storing temperature-sensitive items in Lakewood, climate control is highly recommended. These units maintain temperatures between 55 and 80 degrees year-round to keep your belongings safe from extreme heat and cold. Not only does Extra Space Storage in Lakewood offer large storage units perfect for storing commercial equipment, inventory, or materials, but we also have office space for rent. Contact our staff to learn more! At Extra Space Storage, we strive to provide dependable self storage and incredible service. From our clean, secure, well-maintained facility and our friendly, professional staff, we go the extra mile to ensure you have a great experience with us. Contact us today to reserve a storage unit in Lakewood! If you are looking Firma unit stop by talk to them employees. It’s 100% worth looking at. Great service. Clean bathrooms for costumers. Extremely clean, secure facility with friendly, helpful staff. Brand new facility...spacious, bright, clean and beautiful. So very pleased we found this spot to store our stuff...staff was helpful, friendly and it was a definite A+++++++++++++++ arrangement. I highly recommend this place...a real winner! Super awesome storage facility with great deals and helpful staff. Dont look anywhere else. This is the best. My experiences with Extra Space Storage has been awesome. The staff are helpful and polite. I have used Extra Space in the past with good results as well. I have also tried two other storage companies including PS. I left PS because of their horrible customer service. I would move to Extra Space Storage all over again because of the peace of mind I receive and the way they treat me. You just can't get anything better than Extra Space Storage with quality, customer service, safe environment, and very secure with your valuables. I don't have to worry about someone breaking into my unit. Great storage facility! Multiple PIN locations to ensure security. And the customer service makes sure you get the storage you need. Colfax Ave and Kipling St.
Drive south on Kipling St. Pass W 20th Ave and continue straight on Kipling St. Turn left onto W Colfax Ave. Our facility is on your right just after Hamburger Stand. Drive north on S Kipling St. Pass Lakewood High School and continue straight on Kipling St. As you approach Starbucks, turn right onto W Colfax Ave. Our facility is on your right at the corner of Colfax Ave and Holland St.
Drive west on W Colfax Ave. Pass Walmart and Home Depot and continue straight on W Colfax Ave. Our facility is on your left after Garrison St.
Drive east on W Colfax Ave. Pass Lowe’s and continue straight on W Colfax Ave. Our facility is on your right at the corner of Colfax Ave and Holland St.